Replace a 250-ton and 300-ton chiller at Hubbs Hall with two existing 300-ton centrifugal chillers located inside the basement of Supercomputer Building at UCSD (Supercomputer is now connected to the main UCSD Central Utilities Plant and no longer required the installed chillers). An engineering study was also provided by ABBOTT for replacement options prior to project commencement. 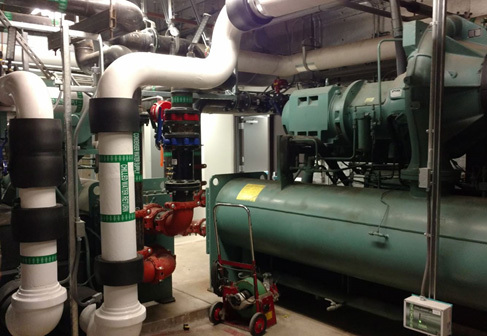 The design incorporated heavy coordination in tearing down and transporting the existing chillers located across campus, bringing them through an operational experimental aquarium and rebuilding the units deep inside Hubbs Hall. The central plant at Hubbs Hall also provides chilled water to Eckart Library and Munk Lab.